Jul 2, 2017: Act 3, Madeira Islands, drew to a nail-biting close today following four days of thrilling action from the GC32s and the Flying Phantom Series. SAP Extreme Sailing Team led from day one, but not without having to fight off advances from Alinghi and Oman Air. Take a look back at some of the best moments. The international fleet reconvenes for Act 4, Barcelona, in less than three weeks. Jul 1, 2017:Watch the highlights from the penultimate day of racing in Madeira Islands. Alinghi was the champion of the day and Red Bull Sailing Team had a dramatic capsize. SAP Extreme Sailing Team remains on the top spot going into tomorrow’s finale. Madeira Islands Day Two Extreme Sailing Series™ Jun 30, 2017: Watch some of the best moments from day two of the Extreme Sailing Series™ in Madeira Islands. The competition heated up in Funchal as the fleet battled it out in eight races. 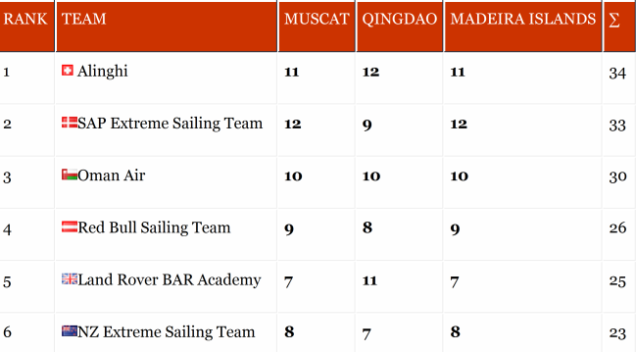 Danish-flagged SAP Extreme Sailing Team stays on top going in to the penultimate day but Oman Air is hot on its heels. Streamed LIVE June 29. 2017. Take a look back at the 2017 Extreme Sailing Series™ action so far, before the battle for the Series title resumes in Madeira Islands, Portugal, 29 June - 2 July. Jul 2, 2017: Two full seasons dedicated to the RC44 class paid off today for Russian Alexander Novoselov, his American tactician Andy Horton and the crew of Katusha, when they won their first ever RC44 Championship event. Jun 30, 2017: Uncertainty continued about the weather for day two of the RC44 Porto Cervo Cup, hosted by the Yacht Club Costa Smeralda. In the event, competitors used most of their sails as, after a light to moderate start, the wind kicked in close to the class’ maximum limit and there were several significant shifts. Thanks to all this, there was plenty of excitement and many many lead changes, but it also proved a high scoring day for the nine RC44s. Video above published May 8, 2017: Watch the highlights from the 2017 RC44 Sotogrande Cup as Team Aqua triumphed in the stormy conditions after a closely fought battle on the final day with local heroes Peninsula Petroleum from Gibraltar. The RC44 Sotogrande Cup was the first event of the 2017 RC44 Championship Tour, which pits the world's top businessmen and the best sailors in the industry compete in high-performance one-design 44-foot carbon racing yachts. RC44 Class Association: RC44 Porto Cervo Cup, 29 June – 2 July. Venue: the iconic Sardinian sailing mecca of Porto Cervo, Italy. Jun 26, 2017: New Zealand celebrates, "We did it. The America's Cup​ is coming home for New Zealand." UPDATE June 26: Emirates Team New Zealand Wins the America's Cup! Sailing a clearly superior and faster boat with a dedicated and talented crew supported by an equally dedicated and talented shore support team, the Kiwis won the first (and only) race on Monday, clinching the 7th (Match) point to become the new Defender of the America's Cup. Congrats to the Kiwis who came back from a devastating loss to Oracle Team USA at San Francisco in the 34th America's Cup. Final Helmsmen Press Conference Race, Emirates Team NZ Wins the America's Cup! Above video streamed LIVE June 26, 2017. Video above published Jun 26, 2017: Artemis Racing skipper Nathan Outteridge speaks to the differences between '17' and 'Aotearoa', ORACLE TEAM USA and Emirates Team New Zealand's America's Cup Class yachts. Key differences include foil shape, control systems and the most obvious being the Kiwi's use of innovative pedal-powered bicycles rather than traditional pedestal grinders. These differences proved pivotal. June 25, 2017 UPDATE: Emirates Team NZ won both races Sunday, sailing faster and making fewer mistakes than its rival Oracle Team USA. Emirates Team New Zealand now leads 6-1 and only needs one more win on Monday to win the America's Cup! Jun 24, 2017: The third day of the America's Cup Match presented by Louis Vuitton saw drama on the water. The Kiwi's took the first race, but ORACLE TEAM USA came charging back to win the second. June 24, 2017: Emirates Team NZ leads 4-1 having won the first race Saturday, and losing to Oracle Team USA for the first time in the second race of the day. Racing will continue Sunday and go into Monday due to USA's win today. June 17-18: Emirates Team New Zealand won races 1, 2, 3, & 4, in dominating fashion, sailing faster and closer to the wind (pointing higher upwind), and leads 3-0. Races continue Saturday, June 24. The Louis Vuitton America's Cup Match races are on the Great Sound in Bermuda--the 35th America's Cup sailing match races in Bermuda--Challenger is Emirates Team New Zealand vs Oracle Team USA, the America's Cup Defender. Monday June 26th (TBC) 11:30 - 19:00 Race 9 won by Emirates Team NZ which is match point to win the America's Cup 7-1 over Oracle Team USA. Video above published Jun 21, 2017: After a couple of days in the shed for some modifications Emirates Team New Zealand​ were back out on the water pushing hard and focusing on continuous gains before America's Cup​ racing resumes on Saturday, June 24. Video above published Jun 18, 2017: Andy Claughton of Land Rover BAR discusses Emirates Team New Zealand's control systems and the developments in play. Emirates Team NZ currently leads the America's Cup 3-0 over Oracle Team USA with races to recommence this Saturday in Bermuda. Emirates Team NZ could "take the Cup back" with 4 more wins against Oracle Team USA this weekend. Video above published Jun 19, 2017: Iain Percy, tactician and Team Manager for Artemis Racing, explains the concept of apparent wind. Apparent wind is the force that allows America's Cup Class yachts to reach 3x the wind speed. In simple terms speed breeds more speed! Video above published Jun 28, 2017: World class sailing, and it all came down to the final race! Next stop: Puerto Portals​ for the Puerto Portals 52 Super Series Sailing Week. Racing starts again on 24th July. Video above published June 25, 2017. Published Jun 23, 2017: Roller coaster racing off the Sardinian coast! The 52 Super Series​ is back on stage and ready to rumble as eleven boats from eight different countries prepare to line up off the Italian island of Sardinia for the Porto Cervo 52 SUPER SERIES Audi Sailing Week, the fourth event in the 52 Super Series six-regatta series. The Porto Cervo 52 SUPER SERIES Audi Sailing Week, 21-25 June. Video above published May 25, 2017: Foiling has pushed the limits of sailing in the America's Cup. Video above published May 28, 2017: Michael Douglas is a Hollywood legend, but what you may not know is that he was born and bred in Bermuda, the Home of the 35th America's Cup. The actor performed the traditional roof wetting ceremony to mark the official opening of the America's Cup Village, and then headed out on the water to take in a spectacular first day of racing." America's Cup racing resumes Saturday, June 24th. Streamed LIVE June 18, 2017. UPDATE June 18: Emirates Team New Zealand won races 3 & 4 in dominating fashion, sailing faster and closer to the wind (pointing higher upwind), and leads 3-0. With the next races on Saturday, June 24, Oracle Team USA has five days to figure out how to match and exceed Emirates Team NZ, or this will all end as an 8-race series on Sunday, June 25th. Forecasts for next weekend call for winds similar to today (June 18). UPDATE June 17: Emirates Team New Zealand won both races 1 & 2 in light wind on the first day, Saturday, June 17, 2017, and holds a 1-0 lead over Defender Oracle Team USA (Emirates Team New Zealand started with -1 point due to ORACLE TEAM USA’s win in the Louis Vuitton America’s Cup Qualifiers). America's Cup Defender Oracle Team USA meets the Challenger Emirates Team USA in the Louis Vuitton America's Cup Match races on the Great Sound in Bermuda. The 35th America's Cup sailing match races started June 17, in Bermuda. The Challenger is Emirates Team New Zealand vs Oracle Team USA, the America's Cup Defender. Video above published Jun 14, 2017: Just one week ago the Emirates Team New Zealand wing sail was in tatters. Now it is as good as new, Emirates Team NZ sailing around the Great Sound in preparation for the 35th America's Cup starting June 17, against the America's Cup Defender Oracle Team USA. Published Jun 13, 2017: One huge checklist before the Louis Vuitton America's Cup Match races begin. In the above video, check in with ORACLE TEAM USA bowman/grinder Matt Cassidy as final preparations are underway. The 35th America's Cup sailing match races start June 17, in Bermuda. The Challenger is Emirates Team New Zealand vs Oracle Team USA, the America's Cup Defender. Video above published Jun 12, 2017: The full highlights from the 2017 World Cup Series Final in Santander, Spain. Video above published Jun 14, 2017: Formula Kite Race highlights from the World Cup Series Final in Santander 2017. Published Jun 12, 2017: Wow, what a rollercoaster of a journey for Artemis Racing and their fans! Artemis Racing brought so much colour, happiness, fun, enthusiasm, determination and sportsmanship to The 35th America's Cup Challenger Series. Video above published Jun 9, 2017: Iain Percy describes the moment they passed SoftBank Japan on the deciding race of the America's Cup playoff semi-finals. Video streamed LIVE June 12, 2017. UPDATE June 12: Emirates Team New Zealand is the winner of the Louis Vuitton America's Cup Challenger Playoffs, winning the first race on Monday and accumulating a total of 5 points to defeat Artemis Racing. Sunday June 11 was another day of super close racing between Artemis Racing and Emirates Team New Zealand including a photo finish in the final race of the day, giving Emirates Team NZ a 4-2 lead in the Challenger playoffs series. Sunday results and Monday schedule below (after LIVE Twitter Feeds of @AmericasCup and @EmiratesTeamNZ). Jun 10, 2017: Incredibly close racing between Artemis Racing and Emirates Team New Zealand on the first day of the Louis Vuitton America's Cup Challenger Playoffs Final in Bermuda. Advantage goes to the Kiwis, but if skipper Nathan Outteridge hadn't gone for a swim in the final race the outcome could have been very different. Louis Vuitton America’s Cup Challenger Playoffs, Saturday June 10, 2017: Man overboard! Nathan Outteridge, the skipper of Artemis Racing, slid off the back of the Swedish challenger Artemis Racing at a critical point in the third race of the day, handing the lead to Peter Burling’s Emirates Team New Zealand squad on day one of the finals. Jun 9, 2017: There was only one race on the final day of the Louis Vuitton America's Cup Challenger Playoffs Semi-finals with Artemis Racing taking the win over SoftBank Team Japan. The two teams were so evenly matched that it made for a thrilling series, but it means the end of the road for SoftBank Team Japan. The Swedes will now advance to face Emirates Team New Zealand in the Louis Vuitton America's Cup Challenger Playoffs Semi-finals. Video above published Jun 17, 2017: Patience, mental fortitude and an unrelenting desire to surmount the challenges posed by fickle weather conditions defined the racing at the 2017 Giraglia Rolex Cup. 209 yachts from over 20 countries took part in the 65th running of the famous 241-nm offshore race from Saint-Tropez, France to Genoa, Italy. After a fascinating duel with fellow Maxi 72 Caol Ila R, line honours was claimed by Dieter Schön’s German yacht Momo. Overall victory on handicap went to the Russian TP52 Freccia Rossa. Video above published May 16, 2017: The 65th edition of the Giraglia Rolex Cup takes place from 09 – 17 June 2017. Organized by the Yacht Club Italiano, with the support of the Société Nautique de Saint-Tropez, this internationally renowned event attracts around 3000 sailors. A reference point in the Mediterranean yachting season, the Giraglia Rolex Cup offers both offshore and inshore racing serving up the perfect blend of camaraderie and competition. Video above published Jun 6, 2017: German skipper and Olympic gold medallist Jochen Schümann talks about the Giraglia Rolex Cup, one of yachting’s premier competitions. Forged from friendship, this 243-nautical-mile offshore race through the Mediterranean brings together fleet of more than 200 yachts, sailing from Saint-Tropez to Genoa, Italy, via the iconic Giraglia rock off the tip of Corsica. Schümann, who won line honours in 2014 and a specially engraved Rolex timepiece, describes how special this race is to him and to the yachting community worldwide. Renowned for its prevailing Corinthian spirit and proud traditions, the Giraglia Rolex Cup is three events in one, comprising overnight races from Marseilles and Sanremo to Saint-Tropez; an inshore series in Saint-Tropez; and the famous offshore race ‘La Giraglia’, which runs 241 nautical miles from Saint-Tropez to Genoa via the islet that gives the event its name. The 65th edition starts on Friday, 9 June 2017. The Giraglia Rolex Cup, which celebrates its 65th edition in 2017, includes one of the most renowned offshore races in the Mediterranean. Following races from Marseille and Sanremo the fleet will gather in the chic harbour of Saint-Tropez for three days of inshore competition before embarking on a 241-nautical mile offshore race to Genoa, Italy via the Giraglia, a rocky outcrop off the northern tip of Corsica. Live Medal Races from the World Cup Series in Santander, Spain, June 10, 2017. Jun 7, 2017: Check out above the highlights from the second day of racing in Santander at the World Cup Series Final 2017, which goes thru June 11, 2017, at Santander, Spain. UPDATE June 8, 2017: Thursday Results below. Emirates Team New Zealand has won 5 points in its races against Land Rover BAR and advances to the Challenger finals which begin Saturday, June 10. Artemis Racing leads 4-3 over SoftBank Team Japan and will race again Friday to determine which will race against Emirates Team New Zealand in the Challenger Finals. Published Thursday, June 8, 2017: Tough day for Ben Ainslie and Land Rover BAR, who, despite a remarkable win today, were knocked out of the Louis Vuitton America's Cup Challenger Playoffs Semi-finals by Emirates Team New Zealand. Meanwhile, the battle rages on between SoftBank Team Japan and Artemis Racing. Note June 7, 2017: Wednesday races were postponed to Thursday due to sea state and high winds. Emirates Team New Zealand capsized during race 4 of the Louis Vuitton America's Cup Challenger Playoffs in Bermuda on Tuesday, June 6, 2017. The team confirmed that all sailors are safe and accounted for after capsizing. “To be honest this is the first time we’ve sailed the boat in this much wind." --LandRoverBAR's Sir Ben Ainslie on Tuesday, June 6, 2017, in the America's Cup LVAC Playoffs. Monday's (June 5, 2017) Results: Emirates Team New Zealand (NZ) won both races against Land Rover BAR (which retired from the first race and did not return for 2nd due to wing damage) and therefore NZ leads 2-0. SoftBank Team Japan and Artemis Racing each won 1 race against each other and are tied 1-1. Video above published on Jun 4, 2017: Land Rover BAR finish the America's Cup Qualifiers in third place with six points and head into the Challenger Playoff Semi-finals. First up Emirates Team New Zealand. UPDATE: On Sunday, June 4, 2017, the first day of Louis Vuitton America’s Cup Challenger Playoffs, races were postponed due to lack of wind, to Monday, June 5, 2017. Jun 3, 2017: The 35th America’s Cup in Bermuda has now been underway for a week. America’s Cup Event Authority CEO Sir Russell Coutts shares his views on the thrilling and dramatic first seven days of action on the Great Sound in his latest vlog episode above. --which will determine the two Challenger finalists, from which the America's Cup Challenger will be selected to race against the America's Cup Defender Oracle Team USA. June 2, 2017: A decisive day on the water at the 35th America's Cup which saw many teams fates determined. Artemis Racing redeemed themselves and will now advance, at the expense of Groupama Team France who are now unable to earn enough points to make it through to the Louis Vuitton America's Cup Challenger Playoffs. Meanwhile Emirates Team New Zealand hit a milestone, as they became the first team to stay up on the foils 100% of a race. June 2, 2017 VIDEO: Another two races and another two wins for Emirates Team New Zealand​ in Bermuda today including the first 'dry lap' by an America's Cup​ team in a race. #ETNZ now on top of the leaderboard. The LVAC teams are currently undergoing a ‘double round robin’ which will end Saturday after competing against each other twice. The team which ends at the bottom of the standings after Saturday [Groupama Team France] will be eliminated. The others advance to the challenger playoffs (except Oracle Team USA which, as Cup defender, advances straight to the final). Each win is worth one point. Tweets by LandRoverBAR Also follow the LIVE @AmericasCup Twitter Feed. The LVAC teams are currently undergoing a ‘double round robin’ which will end Saturday after competing against each other twice. The team which ends at the bottom of the standings after Saturday will be eliminated. The others advance to the challenger playoffs (except Oracle Team USA which, as Cup defender, advances straight to the final). Each win is worth one point. Tweets by EmiratesTeamNZ Also follow the LIVE @AmericasCup Twitter Feed. wind, Round Robin 2 racing continued today in light conditions. The racing was super close, especially in the final battle between Groupama Team France and Land Rover BAR which saw a lead change every single leg. Some teams secured their place in the Louis Vuitton America's Cup Challenger Playoffs, while others are still on the hunt. Streamed LIVE June 1, 2017. Published May 31, 2017: The Daily Review Show: RR2 Races 1-3: Louis Vuitton America's Cup Qualifiers Round Robin 2. Paul Cayard interview. Report for May 31, 2017: "Wind is too light to allow for racing today." Racing will resume Thursday, June 1, 2017. Published May 30, 2017 (races resume June 1, 2017): Tuesday, 30th May saw the first racing of the Louis Vuitton America's Cup Qualifiers Round Robin 2. Another action packed day on the water with highlights being the rematch between Artemis Racing and Emirates Team New Zealand, and Land Rover BAR pulling off an upset in the final race of the day over the Swedes to earn only their second win of the regatta.